Hockey History is a series I’ll do whenever I find something interesting to share with you. This is the first post! Last week I learned about Roller Hockey International, a league that existed for a few years in the 1990s (thanks to Marek, who mentioned it on the MvsW podcast). You can tell it was the 90s because all the RHI team logos look like they were made by Ed “Big Daddy” Roth in Corel Draw. Any of these logos alone qualify as a jersey foul, and some of the names, too: Radz, Rage, and Voodoo, looking at you. Some of these logos are confusing, like why is the cobra wearing a skate if he doesn’t have a foot? Is that a goal stick? Is the cobra a goalie? Wait, Arizona has cobras?! But I digress. Do you see the Oakland Skates up there? When I first heard the name I pictured a green sweater with a white skate logo like the painted white skates the Oakland Seals wore, but I was wrong. It’s like the fish. They’re probably named for several types of skates that live in the San Francisco Bay with all the other frightening sea creatures. Or maybe the Oakland Skates are a band? Look at their first logo. We saw them open at Gilman that one time, right? The Skates only existed from 1992 to 1996 and had few players of note, including NHL official Dan O’Rourke, who from now on will be known as Former Oakland Skate Dan O’Rourke. As far as I can tell, he’s the only skate that went up to the NHL (a few played their prior to their roller careers). Current Medicine Hat Tigers GM/coach Shaun Clouston also played for the Skates in their first two years before coaching them in 1995-96. And who can forget Question Marks Desjardins? Old Q is probably Stephane Desjardins, who played for 30 hockey teams during his ice and roller careers, so it was only a matter of time before one of them forgot his name. But none of these guys are as important as one man from the 1994-1995 roster. It’s not because of what he did on the ice, though 10 points and 65 PIMS in 8 games is impressive. It’s not because of who his brother is, though you’ll probably think he’s rad too. It’s not because he’s 5’9″ and I love short hockey players. This man rules because he has one of the most amazing hockey cards I’ve ever seen. It’s not even from his time with the Skates, but I did find it on his hockeydb page via the Skates roster. Behold this amazing round hockey card featuring 1994-1995 Oakland Skates defenseman Steve Chelios. Yes, Steve. Great hair aside, this is a very strange hockey card. It’s round because it came in a plastic pack of cards that was shaped like a puck, or it could just be a giant POG–it was the 90s, so that’s totally possible. Now that I know it exists, I need to have it. I kinda collect hockey cards, meaning sometimes my boyfriend will grab them for me at Target, or if I learn of one I really like I’ll eBay it. Unfortunately there are no Steve Chelios cards on eBay, but there is a round one of his brother and Steve Yzerman. Not the same. I want this card, and I want to it on my icon wall next to the archangel Gabriel and his hockey tournament participation medal. 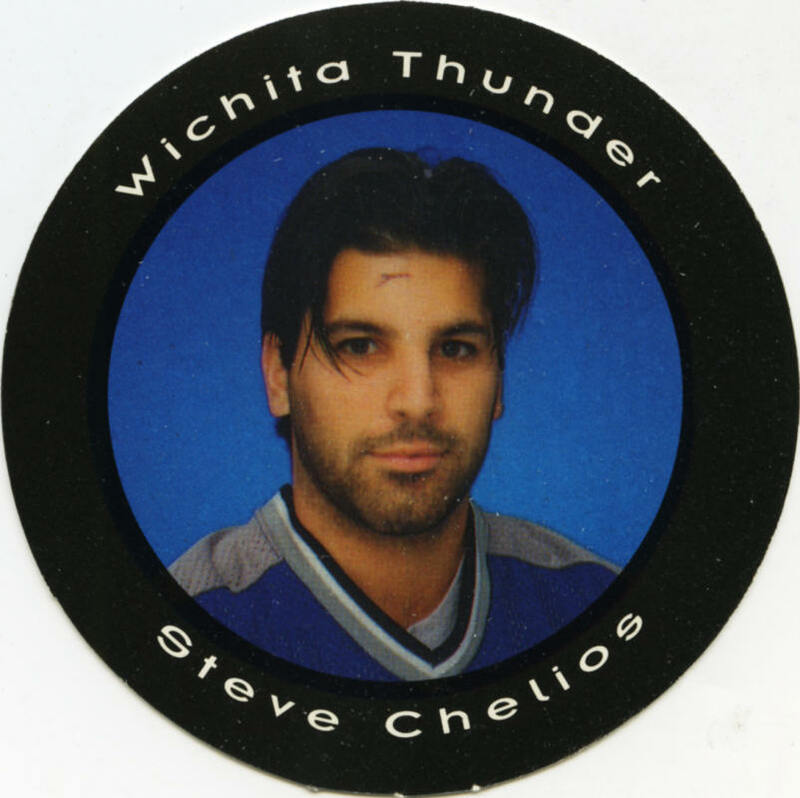 Please let me know if you have one of these round Steve Chelios cards. I’ll trade you for it!